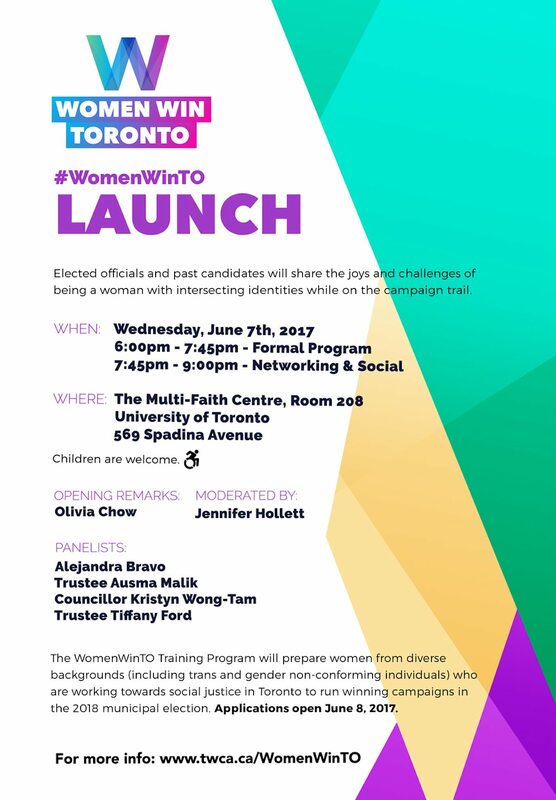 Women Win Toronto, an organization to help women run for municipal office, is holding a launch event Wednesday. How do you know you belong? We often look to our communities for the comforting feeling that we belong in Toronto. Being able to connect with our neighbours and see ourselves reflected in our city is an important aspect of belonging. But for many of us who deeply care for our city, we have become concerned when we see family and friends who face an exhausting commute, are unable to afford a home in which to feel safe, or aren’t able to find or sustain a job that can pay for a life in the big city. These are some of the various issues that lead to people choosing to pursue politics, specifically running for city council, to fight to make Toronto a stronger and more inclusive city. Unfortunately, the reality is that in 2014, only 14 out of 44 Toronto City Councillors elected were women. Of the 44 councillors, only one councillor, Kristyn Wong-Tam (Ward 27, Toronto Centre–Rosedal), is a racialized woman, and she is also the only openly gay member of Council.These figures are in stark contrast to the population of Toronto that city council represents. Toronto’s population is 52 per cent female and 48 per cent male. The population that identifies as a visible minority is 49 per cent. It can be liberating to defy the odds and win a seat amongst seated representatives who don’t look like you. It can be freeing to believe that you too belong on city council, particularly as a racialized, Indigenous, or trans woman. Fighting for a seat on city council is not for the faint of heart. We know. Candidates must be able (and willing) to sustain themselves through months of unpaid campaigning where you spend long, lonely hours knocking on doors, worried you may be a long shot at best. Signing up as a candidate takes strength and courage. But many of us struggle with additional challenges. Those entering the race without the connections of family or friends in politics must find a way to fundraise, network, and learn to present ourselves as candidates. In a democracy, some argue, we all fight for our place in the world, and an uneven playing field is just part of the game. Often as a candidate, you look for mentors, someone who has shared your experiences and can serve as evidence that, even though the odds are slim, you can also run and win a seat on Council. But when few councillors share your background, finding that role model is challenging. And unlike any other job interview, it is ultimately not your work or volunteer experience that will make you a strong candidate. Your ability to organize; your commitment to follow your values; your resolve to work long hours through your own doubts, the discouragement of some, and the support of countless others will determine your ability to make it through the campaign. Learning how to be a candidate or support one by running a campaign is something you can do with the appropriate team and tools. Finding a community of like-minded political enthusiasts you can call in the middle of the night with a burning question; or who make you feel like your commitment to running for office is perfectly reasonable after a lively candidate’s debate, is essential to surviving the campaign. Because, while you struggle to find your own footing as a candidate, you must present a fearless face that others believe in to secure votes and support for your vision of Toronto. To that end, a group of women with backgrounds in politics, strategy, and communications have launched Women Win Toronto 2018. We are offering a training program from the fall of 2017 through the winter of 2018 to prepare women for the municipal campaign period, which begins on May 1, 2018, and culminates on election day, October 22, 2018. Together we can build a community of candidates and campaign managers, primarily diverse women who are underrepresented on Council, including trans and gender non-conforming individuals, and we can work to win seats to ensure Council better represents Toronto. Come and learn more on June 7 from 6-9 pm at the University of Toronto Multifaith Centre at 569 Spadina Avenue.